All Posts Tagged With: "Elemis"
Maintain the perfect bikini body this summer with handpicked firming and detox products from Elemis’ Director of Product and Treatment Development, Noella Gabriel. Made with the pure natural Elemis cactus bristle brush. Body brushing daily increases circulation, improves metabolism, eliminates dead skin cells and helps the body’s natural detoxification process. 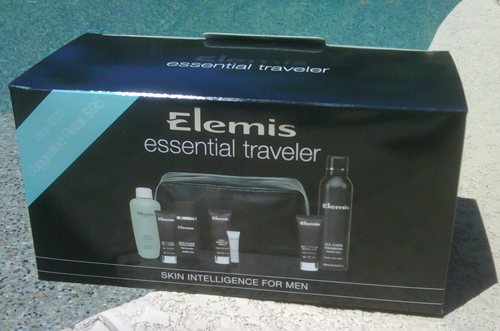 Loving the Essential Traveler Set for men from Elemis. Father’s day is around the corner (wink…wink:)! Give the well maintained or well traveled dad in your life a collection of cutting-edge professional skincare products from Elemis that deliver powerful results. The Essential Traveler set is filled with 7 award-winning and clinically proven formulations that are all dad needs for energized, hydrated skin. This year, Beauty.com has partnered with CEW’s Cancer and Careers initiative. In addition to creating a BCA (Breast Cancer Awareness) store with an assortment of products that benefit different BCA charities, from October 12-18, if you click on www.beauty.com/cancerandcareers , 10% of all purchases made on Beauty.com will be donated to CEW’s Cancer and Careers. You can buy ANYTHING sold on the site, not just BCA products (nothing is restricted in any way). This gives you the opportunity to stock up on their favorite brands and products you would normally buy and help give back – so easy. 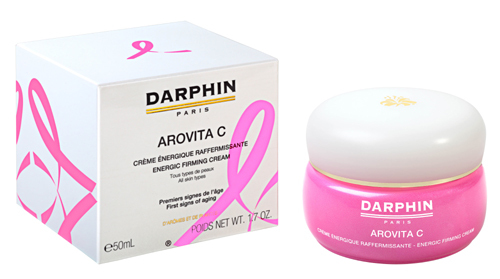 Darphin Arovita C Energic Firming Cream for BCA: This invigorating, vitamin-enriched Darphin facial cream helps firm skin and fortify its natural resiliency to visibly correct first loss of elasticity of the face and neck. Arovita C Energic Firming Cream moisturizes and renews radiance while helping safeguard the complexion against environmental aggressors. Key Ingredients Include: Artemia salina, Carrot Protein, Noni Extract, Vitamins C and E. Darphin will donate $20 from each sale of Arovita C Energic Firming Cream during the month of October to The Breast Cancer Research Foundation. After finishing a whole tub of the very luxurious Elemis Pro-Collagen Radiantly Smooth Body Cream in just under a month, I became a believer in Elemis skincare. So I wanted to share with you two new products from Elemis, which I would also love to try: Elemis Maximum Moisture Day Cream and Elemis Maximum Moisture Night Cream. Throughout the month of June, Elemis will offer two for one SpaPod treatments on Tuesdays and Wednesdays. This special offer means TWO 30-minute Power Booster Facials for ONLY $55. In case you’re not familiar, the Elemis SpaPod offers 30 minute Power Booster Facials to rejuvenate the body and skin without having to undress or even take off your eye makeup. The therapies are performed on an Intelligent Massage Chair that measures the length of the spine, takes your body weight, warms the body and delivers a customized massage program using a variety of techniques on the calves, legs, buttocks, back and neck – basically the ultimate quick indulgence. For the month of June on Tuesday and Wednesdays, customers will be able to book 2 SpaPod’s for the price of 1. 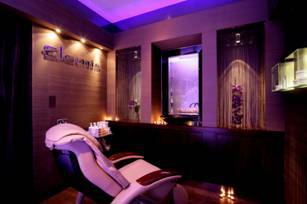 Both men and women can enjoy the Elemis spa experience in the convenience of the department store. It is a total skin and body rejuvenation in a half hour without having to undress. Choose from 5 different 30 minute Power Booster Facials (depending on your lifestyle and skin type) while experiencing a customized massage in the Intelligent Massage Chair. It’s 30 minutes of heaven and afterwards you can pop by your favorite makeup counter for a touch up (or head upstairs for some shopping)! WHERE: Bergdorf Goodman Cosmetics Floor, and Nordstrom Michigan Ave Chicago-Woodfield IL-and Oakbrook IL. WHEN: Tuesdays and Wednesdays for the month of June. HOW MUCH: $55 (so for $55 you get $110 value). 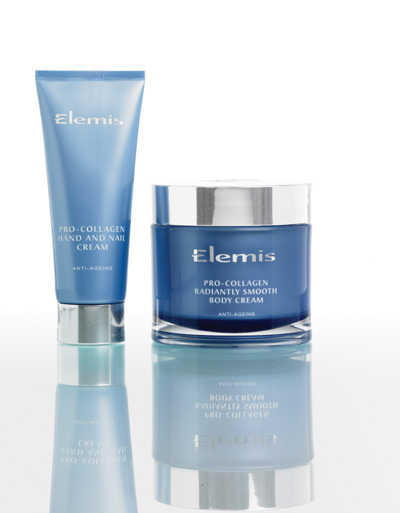 The British brand Elemis, known for luxurious spa treatments and their cult-favorite Pro-Collagen Marine Cream takes on at-home anti-aging body care with the Pro-Collagen Radiantly Smooth Body Cream and Pro-Collagen Hand and Nail Cream. Now your favorite Pro-Collagen product doesn’t have to be limited to just your face-it can be smoothed from head-to-toe. Pro-Collagen Radiantly Smooth Body Cream: this groundbreaking product helps to smooth our crepey skin texture, leaving the skin deeply hydrated with an illuminating youthful radiance. A network of Proteins, plus Micro-Lattice Technology ensures a mesh-like support system is provided over sagging skin whilst helping to restore cell cohesion. Combining a luxurious souffle texture with iridescent sheen and nurturing aroma of Rose and Mimosa, the sensuality on application of this targeted, Anti-Aging Body Cream will also deliver an instant feel-good factor. SRP: $162. Pro-Collagen Hand and Nail Cream: not just your average hand cream, this non-greasy, satin after-feel cream targets skin crepiness, sun damage, redness, discoloration, weakened nails and dryness. Containing powerful anti-oxidant that protect against external drying factors and ensure targeted intervention from the first signs of ageing through to mature skin, this cream delivers irresistibly smooth, youthful looking hands whilst conditioning cuticles and helping to maintain healthy, strong nails. SRP: $60. Elemis products are available at: Nordstrom.com and TimetoSpa.com. The first ever global Elemis Earth Day Celebration is taking place on April 22nd, 2008. 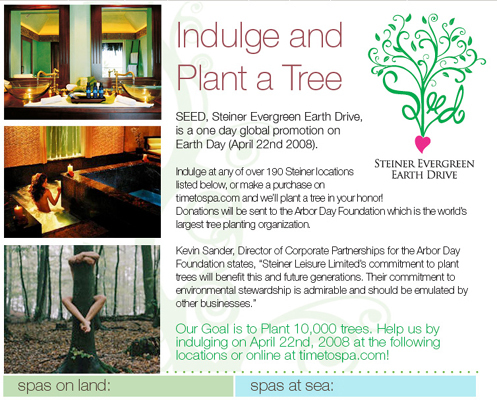 In recognition of Earth Day, Elemis will plant a tree for every guest that has an Elemis spa service in any spa on land, at sea or when an Elemis product is purchased online at www.timetospa.com . The trees will be planted through the Arbor Day Foundation, the largest tree planting organization in the world! For a full list of 185 spa locations participating in this Earth Day visit: www.timetospa.com/earthday . The goal is to plant over 100,100 trees! 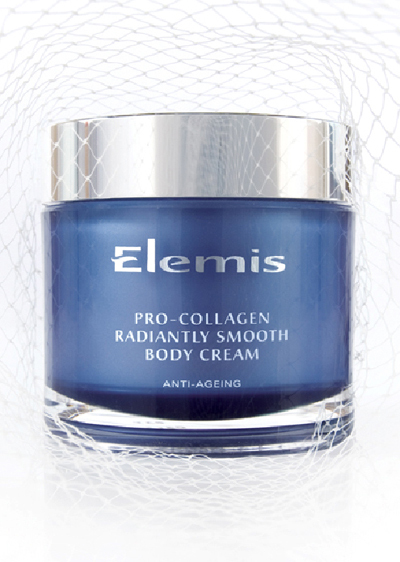 Elemis, the award-winning British spa and skincare brand is proud to bring to market the next era in luxury Bodycare with a new Anti-Aging Body category: Elemis Pro Collagen Radiantly Smooth Body Cream. Over three years of intense research inti ground-breaking Micro-Lattice Technology-using a lipidic lamellar structure in formulation design to target areas of the body lacking micro-tension-sees the launch of Elemis Pro Collagen Radiantly Smooth Body Cream. What it does: Elemis Pro Collagen Radiantly Smooth Body Cream helps smooth out crepey skin texture, leaving the body feeling deeply hydrated and radiant. 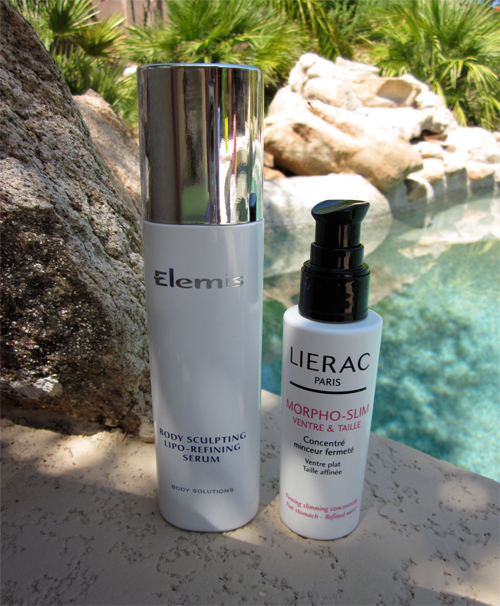 Helps restore cell cohesion and sagging skin. Offers a “movement with tension” to the skin so the overall result is just like wearing a pair of tights: you can distinctly feel the body’s improved contour. Elemis Pro-Collagen Marine Cream is a powerful anti-aging cream with a progressive lifting effect through increased collagen support. Elemis Pro-Collagen Cream promised results in just 15 days. Ingredients include: marine algae padina pavonica, absolutes, gingko biloba, and liposomes. Elemis Pro-Collagen Marine Cream is clinically proven to reduce the depth of wrinkles by 19% and increase hydration and moisture levels by 10%. Cost: $124 for 1.7 oz. 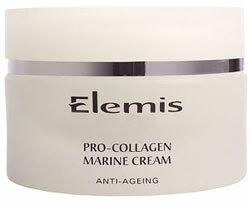 You might also like: Elemis Pro-Collagen Marine Cream Luxury Edition, $210 for 3.4 oz.